No more getting into a hot car when you are covered in sand and salt. Located right on the beach, you will find this the archetypal beach house. Comfortable and well appointed with all amenities including a toasty combustion fire, gas BBQ, a CD player with a selection of CD's, TV, DVD, VCR, MP3 jack, dishwasher, espresso machine, full laundry and a second toilet and bathroom which is accessible from outside only - perfect for when enjoying a BBQ or for off the beach. There are many extras including an esky, picnic basket, a cupboard full of books, games, toys, DVD's and videos.There is also a large supply of beach toys including boogie boards, under the house. There are 3 bedrooms with 2 queens and a tribunk with another single in the third bedroom so will sleep 3 couples comfortably. We hope you will like our newly renovated bathroom. Apart for a few stairs into the cottage, it is all on one level inside and access to the beach is virtually flat. I can provide at no charge an over-the-toilet commode chair and shower chair for our older guests or a cot, high chair and baby bath for the little ones, on request. There are large decks front and back, both with outdoor furniture, and plenty of parking for your boat or extra car. There are timber floors in the main areas, carpet in the bedrooms. 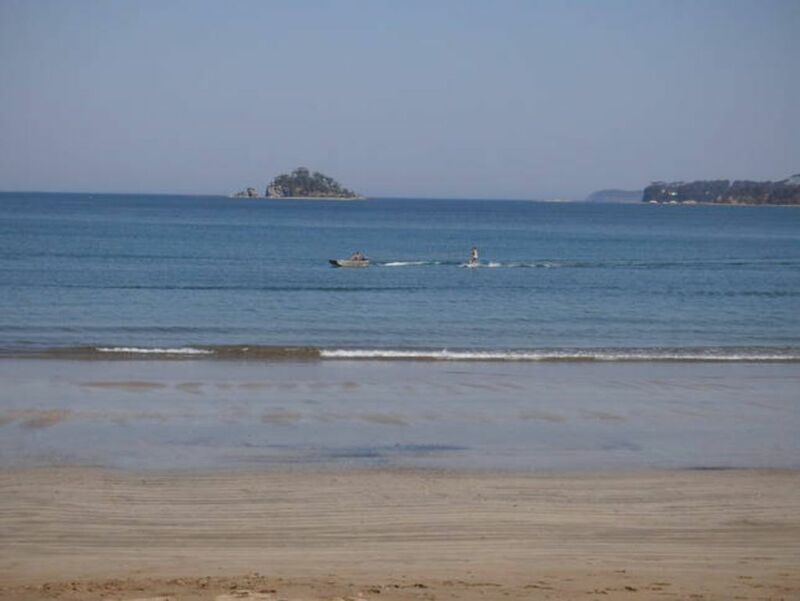 We are very close to town, on an excellent swimming beach which is also suitable for most other water sports including fishing, windsurfing/kite surfing, kayaking etc. Please let us know if you wish to bring any pets with you. You can enjoy flexible arrival and departure times when vacancies allow but please check with us first. There is also excellent mobile phone reception. Please email for our tariff sheet and map. NB our prices cover up to 6 people but it can sleep 8 but this may not suit adults $25 pp for any extras. Please note that linen is not included but can be hired for $10 unmade or $15 made up, per person. If we are booked here, please have a look at our other beach front property, The Riverside Townhouse. Located right on the dunes with magnificent views of the Tollgate Islands and the bay. It is about 2 kilometres to town (enjoy walking into town via the beach at low tide), has a local shopping centre with a superette, and great bottle shop, take away and hair salon and is in a quiet residential area. The property is unfenced but dogs are allowed inside provided they are fully house-trained, kept off the furniture, are kept well groomed and free of sand and treated for fleas (tick treatment also recommended). We charge a $20 fee per dog per booking to cover the more frequent carpet cleaning, preventative flea treatments to the property etc. If your dog is a shedder, we would appreciate you using the vacuum or additional cleaning may be charged. Please let us know if you are bringing a dog. PLEASE NOTE - WE DO NOT ACCEPT SCHOOLIES OR GROUPS. Apart from the beach at your doorstep, there are the wonderful shops in Mogo and of course the Mogo Zoo, Birdland, bushwalking, fishing, golf, many other water sports including cruises up the river, fishing charters and hire boats. We have two cinemas, many clubs and a great choice of al fresco waterfront restaurants to choose from. You can always just enjoy walking your dog along the dog friendly beach around the corner, but please do the right thing and clean up after your pet. NB WE BOOK WEEKLY ONLY DURING THE SUMMER HOLIDAY, HAVE A 2 NIGHT MINIMUM ON WEEKENDS AND DURING SCHOOL HOLIDAYS AND A 3 NIGHT MINIMUM ON LONG WEEKENDS where the weekend rate will apply to all nights. SINGLE NIGHTS will be considered and will depend on day of the week and other bookings but a $50 surcharge will apply which goes towards our cleaning costs. A $500 security deposit is required on all bookings. We do not charge a cleaning fee but please note that if the BBQ and other cookware is not cleaned, a penalty may apply. Second bathroom is accessed from outside and has a shower and toilet. Perfect for off the beach. Wonderful view looking out to see with Snapper Island and the Tollgates in the distance. This is absolute beachfront with no roads between the house and the beach. Couldn't get closer. Looking south with a view of Tollgates and Snapper Island and Batehaven in the distance. The beach is right in your back yard. No roads to cross or cliffs to climb. Couldn't be closer. Espresso machine using ground coffee not pods. Just some of the basics including tea and coffee on your arrival. Includes a jack for your electronic music. One front and back, both with dining furniture so if one side is windy, you can enjoy the other side. Thanks Aimee. So glad you enjoyed your stay and we would certainly love to have you back. Hopefully see you soon. We recently stayed at the Beach House & it was really good to be able to just go for a walk along the beach whenever we wanted to. The house has everything you need & can't wait to go back again. Thanks Michelle - so glad your stay was special and we hope to see you again in the future. Rosemary is a wonderful host who truly will go out of her way to make sure you are well cared for. It was a place that allowed my family and I and our dog Molly, a relaxing, happy, memorable mini holiday. My family and I LOVED the views and how close the beach was. It was quiet and tranquil at this time of the year and exactly what we needed. Rosemary and Rod - we loved our stay and we will be back! Thanks for such a wonderful review Caterina. We loved having you and look forward to seeing you again. It is actually a quiet area the whole year through. Even in the peak season you wouldn't count more than about 50 people on the whole length of the beach. A forgotten paradise so close to town but off the tourist track. House is nice and close to the beach with a lovely view from the balcony. Unfortunately the house took a while to warm up after we arrived. The only Heating available is the fireplace . The heat from the fire Did take a while to filter through the house. Leaving it going most of the time helps. We did ask for another form of heating as by nightfall the house did become quite cold. The owner did Supply us with an electric heater. There was only one electric blanket in one bedroom. Apparently the owner stated the others had gone missing .I would recommend replacing them in the other bedrooms as the bedrooms were very cold. There were no fire alarms in the house only a couple of brackets in the ceiling. The owner did replace one for us . Thanks again for doing that. A split system would work really well in that house for the heating as it would enable you to take the chill out of the place . I noticed post our stay that another persons review last year had experienced the coldness of the house. So perhaps ensure you bring lots of jumpers and a heater with you if you want to stay August or September time. Disappointed that you felt the cold but all beds except the top bunk had electric blankets and there were doonas on the beds as well as plenty of spare blankets. They had not been stolen as they were there after your stay. The combustion fire is very efficient and does take a short while to warm the house through but you are able to shut off the living areas and bedroom doors which help until it warms up. We are told that the fire is very efficient and no-one has ever asked for additional heating. We had just returned from 4 months overseas and the two smoke alarms had been broken off their brackets and were immediately replaced. Perfect weekend exactly what we hoped for. Thank you Laurence for your lovely comments and glad you enjoyed your stay. We appreciate your care with the property and you are welcome to come again any time. We had a great stay. The Beach House was comfortable, spacious and in a great location. We really relaxed sitting on the back decking with it's view and sound of the ocean and it was really convenient to be able to go straight from the back door to the beach and take a fishing rod and a chair with you. The kitchen was roomy, very workable and stocked with most things you could wish for. We walked into town, one of the days, around the beach and over the bridge, which opened for the ferry to go through whilst we were crossing, which was neat. It was only 5 minutes in the car to town also. We met up with Rosemary, to pay for our linen package, and she was friendly and helpful and we found the communication easy throughout our stay. There was just the two of us staying but we could see it would be great for a larger family too. It was a very enjoyable stay for us. Thank you for taking the time to send a review. In response I must say that you were perfect guests and I would highly recommend you to any other property owners that you might wish to stay with. In saying that, I really hope you will return again, perhaps with more family members as there is plenty of room for more. Located in a quiet residential area but oh so close to town. Stroll into town via the beach or explore the national park and the board walk to the north. Visit Mogo's interesting shops or it's zoo, or just put your feet up and enjoy the view from The Beach House and the crackling fire in the winter.